Two big trips, and I'm very pleased to be back at home. Its been a very busy time, three boat shows, two small boat gatherings, a two week boatbuilding course, a two day workshop skills course, a one day one on epoxy and fiberglassing, eleven presentations at shows and gatherings, way way too much time in cars and aircraft, enormously way too much time in airport terminals ( if there is a hell on earth, they are a very close cousin) and even more enormously too much time away from home. I had worried about how my recovering physical condition would cope, but with the help of good friends and lots of sleep along the way I got through it, but you can bet that I’m feeling more jetlagged than I’ve ever been before. The trip home went as follows. Travel from my friends place to the airport, 1 1/2 hours. 3 hours at San Antonio Airport, not a bad place as far as airport terminals go, then a 45 min flight to Dallas Fort Worth. 4 hours there, and if I was about 7 years old I’d have had a lot of fun riding the elevated railway that connects the various elements of the terminal. It’s a good system with good views out the big windows. Its clean and prompt, well signposted and, at least when I was there not crowded. Then, THEN! The monster airplane, the Airbus A380 double decked super jumbo. 16 ½ hours, the longest scheduled airline flight in the world, nonstop for 7 ½ thousand nautical miles from DFW to Sydney Australia. That aircraft is a revelation, its still a big tubular prison in the sky, still a high tech sardine can packed with bored and uncomfortable people, but in fact there is a lot of room to move around, you can walk for quite a distance, the restrooms are plentiful, there is a little snack bar down aft with cookies, fresh fruit, water and cans of soft drink courtesy of the management, and space enough down there to do your stretches and excersize. The seats seem a fraction wider, the legroom a little better, and the seats lay back a little further. They’re not as uncomfortable as most other airline seats, and there is a good choice of movies and entertainment on the little tv screen. The meals are ok, the limitations of having to have meals pre prepared and reheated mean that you don’t get a la cart restaurant food, but its ok. Two full meals plus a snack bag for midnight munchies, the crew cruise the aisles at night quietly checking that everyones ok and will bring whatever you ask for, water or food. I saw the hosties sitting and chatting with people a couple of times and for me, travelling as “impaired hearing” ( I’m mostly ok apart from when there is a lot of background noise which makes Airport terminals difficult) Lois went and got me a pair of full earmuff headphones from first class so I could hear the soundtrack on the movies. Thanks Lois, much appreciated. By the way, I really enjoyed “ How to tame your dragon” one and two! Real fun that did not require much concentration to follow. There were 42 movies available, plus music plus a whole range of tv programs (without the ads) games and such. The big plane is smooth, turbulence does not affect it nearly as much as smaller aircraft, and its much quieter. It’s a good experience as far as air travel goes. I asked Lois if the cabin crew had a space of their own, and yes they do, a bunk and a little bit of privacy which is possibly one of the reasons that they were all of them cheerful and helpful throughout the flight. Quantas has a new CEO, and they have really upped their act. Well done you guys. Air New Zealand, get with it! Back in Sydney, that place is not one of my favourites, not as bad as LAX (which scores minus 10 on the “Pits” scale ) but very very noisy and uncomfortable. Only an hour and a half there, but why, when having been screened to get onto the previous flight, and in an area where one has to be screened to get into, do we all have to go through another screening to get onto the flight back out of Sydney? I think its an employment program for retired police officers or sommat. 3 hours 45 mins to New Zealand. Half an hour to get out through immigration and customs, this time they did not lose my baggage. An hour to get out to the motel where my little truck was stored, and then two hours to where my bed is. I’d been travelling for almost 40 hours and travelled about a third the way around the globe plus from 30deg north to 35 deg south. Tired does not describe it. Its four days since I got in, and while I don’t usually suffer from jetlag, in the past I’ve not had the issues that I’ve had of late but I’ve been sleeping a lot, puttering around very gently and am just about back to normal. I came home with a lot of work to get on with, am still in catchup mode on the outstanding work, and am in better shape than I have been in a while. Right now, I’m in my bunk on the ship. Its raining, the river is interestingly bi coloured as the grey green incoming tide pushes the silty runoff of the river back up ahead of it, the rain sounds like a team of snare drums beating on the cabin top, that’s sort of peaceful. Or it would be if my little dog was not running around growling, demanding to be let out to go and fight the thunder and lightning that’s been rumbling and flashing for the past hour or so. Its very nice to be home. Progress reports. I’ve been away, no excuse really for not having updated the blog other than its been a very busy time away in the Pacific North West. I’ve lots to blog about, and will be updating a couple of times a week until I’m all caught up. I’ve had a couple of people ask how I’m doing health wise, the answer is that I sleep a lot, and the travel knocks me around a bit but I’m steadily improving with regular visits to the haematology clinic, and am gradually regaining fitness. So, much better than I was, and the prospects of continued improvement are good. Thanks for asking. I wrote this post intending to upload it that day it, but my camera with the pics ended up in one place, and me in another, then when I got home it was back to the clinic, then catch up with weeks of chores that built up while I was away. Today I head out for Sail Oklahoma, then the Port Aransas PlyWooden Boat Festival. Looooong flights, but hey, I don’t get to see all those people very often. 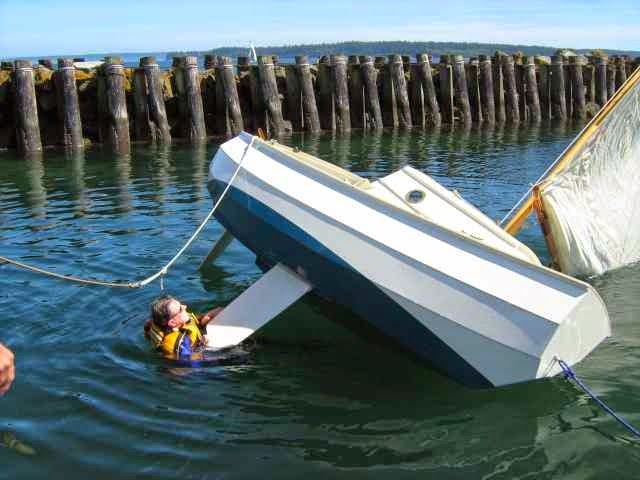 The SCAMP build class is not the only event here in Port Townsend that I am involved in, the Port Townsend Wooden Boat Festival is another, and there is usually an event run by the Small Craft Skills Academy . This year I also had the privilege of being involved in the SCAMP Skills class that Howard Rice was running, a course devised to teach SCAMP Skippers how to better handle their boats, teach them some of the special manoeuvres peculiar to the fat little boat with its unstayed balanced lugsail rig. This was a three day course, a nice small class of great people and enough boats to have a really good time out sailing (practical, as opposed to classroom work, “Homework” if you like. ) and even the antics in the classroom were fun. An example, we had the group standing up and practicing gybing, walking away from the instructor with an arm out to represent the boom and performing the “S Bend” gybe, same with “Parking” and “Flagging”. All manoeuvres that are possible with unstayed rigs, and made easier by the soft handling and simple balanced lugsail rig. Watch SMALL CRAFT ADVISOR MAGAZINE for an article on these manoeuvres, while developed for SCAMP they are very effective on any boat with an unstayed mast. Capsize recovery also involved some classroom work, while SCAMP is unusually stable it is still a small open boat, and the waters here are cold so righting and reboarding is a necessary skill. One that its hoped that will not be required, but good to have. Pulling the boat up, the offcenterboard gives a lot of leverage and the boat comes up very easily. We tried a different approach for reboarding, if you look hard you can see a rope "sling" that the "reboarder " has his feet on, this sling to be stowed along the side deck and held there tidy with a tie of knitting yarn that can be broken with a pull. The "sling" was set at a depth that enables the person in the water to get both feet onto it while afloat in their PFD, and then simply stand up and roll forward into the boat. This is a much easier maneuver than the stirrup that had been the recommended system of getting back into this high sided boat. Credit to Howard for an idea that will make the boat even safer. As has happened before, the first few attempts were not successful in getting the boat to stay on its side, as soon as the crew dropped into the water the boat popped back up, but the reboarding drill was still valid. In the past we’ve used a “Stirrup” on a line, a system developed by Howard, useful but it requires a precise series of moves to get up and over the high side of the boat and into the cockpit. This time though he had a better idea, and we’re working up a system that will use a safety line laid along the gunwales, one which can be pulled down and used as a place to place feet, use the strength of both legs to stand up and roll back into the boat. The class found this very much easier to do than the stirrup method, better suited to those less fit or less strong in the upper body, and our observation was that someone in heavy wet weather gear, cold, and stressed out by the capsize would be more easily able to get back out of the water and under way again. Success, Back on board. Phil McGowan with a big smile, yes thats a drysuit, nothing like really cold water to motivate someone to get back on board as soon as possible. 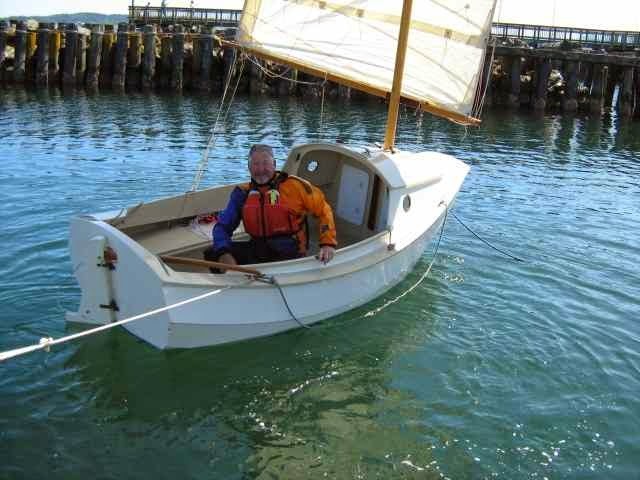 There has been much talk of the capsize issue, and to elaborate, SCAMP is unusually stable, I weigh in at just over 200 lbs dry, and can stand on the gunwale with almost the whole top plank clear of the water. Howard once tried to tip number one over in front of several thousand people at a boat show, and failed. After a number of attempts he got her to 90 deg and much to everyones amusement as soon as he dropped into the water to swim around an right her, she popped right back up on her own. 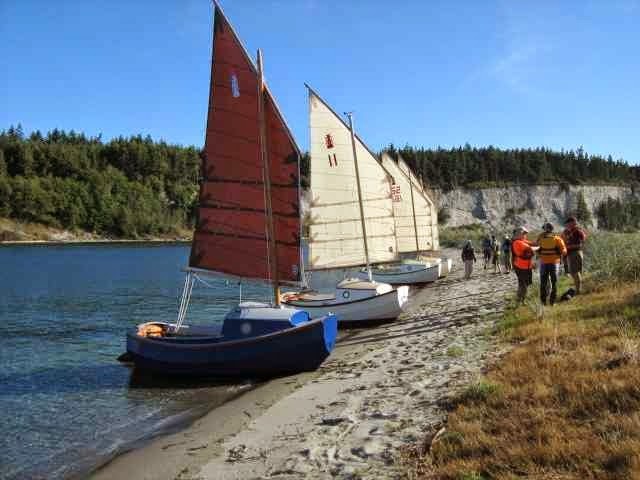 There are NO other 12 ft sailing boats that will tolerate that kind of use without falling over. But we like to be sure that our fellow SCAMPers are safe, hence the research. We had a good time running this skills course, presentations by some of the class members contributed, the class members themselves were a great bunch of people and its an event that I hope I can attend again. A daysail out to Rat Island out at the entrance to Killisit harbour between Marrowstone Island and Indian Island off Port Townsend. A day of practical "homework" after the classroom and dockside classes. On the middle weekend of SCAMP Camp, that’s the build class of course, we had a gathering for SCAMPers which included not only the boats and students from the SCAMP Skills class, but also the participants from the kitset build class. That’s the subject of the next posting on this blog. In the meantime, I’m having a very quiet time before the hustle and bustle of the Port Townsend Wooden Boat Festival which starts on Friday next. 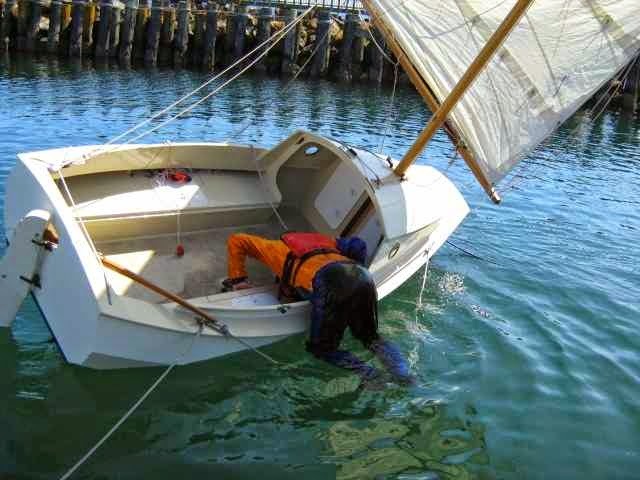 A reminder, these programs, both sailing and building are run by the Small Craft Skills Academy, http://www.smallcraftacademy.com/ , have a look through the site, bookmark it and watch for the next update which will have details of next years courses.